If running economies is anything to go by, the famed luck of the Irish seems to have deserted the Emerald Isle in recent years, but when it comes to slots, enthusiasts still hope that some of that legendary streak will rub off on them. 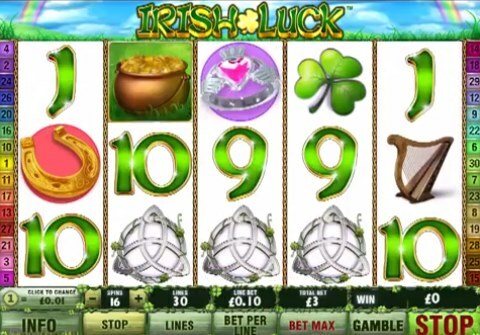 It’s good for them, then, that online casino slot developer Playtech’s Irish Luck is here, as the developer has taken a popular theme in slots and run with it big-time. A 5-reel, 30-payline game, all your Celtic-tinged fiddle-dees are here: Celtic knots, lucky horseshoes, harps, rings, four-leaf clovers: just how many good luck symbols do you need?! Making up the reels are the 9-through-Ace symbols, here in glorious emerald green and adorned with shamrocks, a gold pot (more of that later) and the beautiful Celtic woman who can mean the difference between losing and winning big. To top it off, there are some nice Irish noodlings going on in the background for music and vibes. Our flaxon-haired temptress acts as the Wild. Substituting for every symbol other than the gold pot symbol, she’ll bag you 10,000 coins if you get five across the reels. When she helps in winning combinations she zooms out, and is seen standing in a field with a rainbow as a backdrop, with small golden butterflies fluttering around the symbols. No, you haven’t had one Guinness too many, you’ve just bagged another winning combination. Three or more gold pot symbols triggers the bonus round. This prompts a mischievous leprechaun to push pots of gold across the center before a separate screen appears full of gold pots. You’ll start off with eight free spins (with a 2x multiplier) but pick the right two gold pots and you could win more spins or an increased multiplier. In all you could bag 33 free spins or a 15x multiplier. Not only that, they can be re-triggered during the bonus round. If you’re going to make a stereotype, make it a good one – and Playtech tick all the right boxes with their Irish-tinged jaunt. The graphics and sound FX here have had some real effort put into them, which is nice to see, and the bonus round is limited but lucrative. Fans of Celtic mayhem will enjoy the visual delights of Rival Gaming’s St. Patrick’s Day-themed slot, Shamrock Isle, and those of you hunting out slots with Stacked Wilds such as this should seek out Playtech’s 50s-themed slot, Marilyn Monroe. 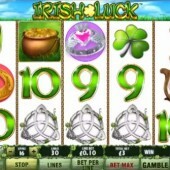 But there’s plenty here to make Irish Luck a must-have on your list of preferred games.